China is a massive country, and with only two weeks, it can be hard to know where to start when planning your China itinerary. Many visitors stop by the main cities: Beijing, Shanghai, and maybe Xi’an. But what if you really want to explore the country and get off the beaten path? After five years of living in China, and plenty of experience planning itineraries and showing my friends and family around, I’ve come up with the perfect two week itinerary for China. 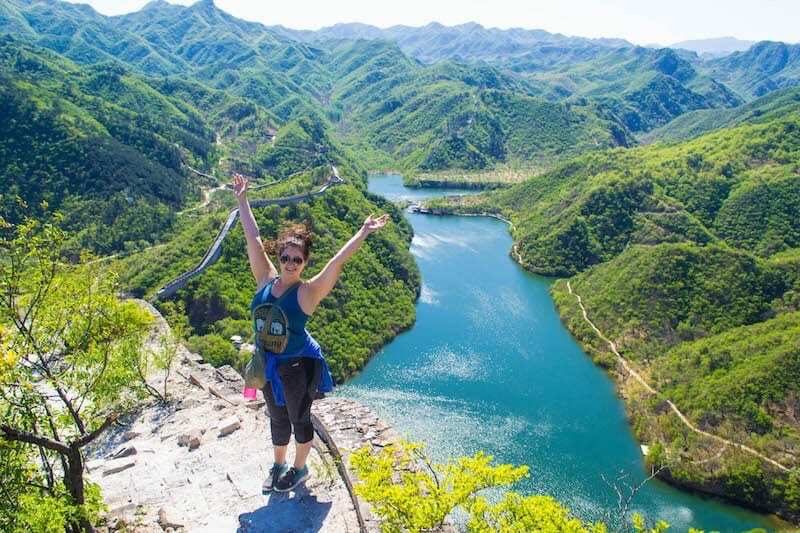 This route will give you a great sample of things to do in China and help you explore the major sights while also spending some time on the Tibetan Plateau. So, where to go in China? Below is the Ultimate Two-Week Itinerary for those who want to get off the beaten path and see some of the best places to visit in China. It’s not a trip to China without stopping by the capital city of Beijing. After a solid two-years of living in Beijing, I might be a bit biased, but there are so many incredible things to do in this city. From hiking the Great Wall of China to wandering the Forbidden City, and exploring Beijing’s hutongs, you could spend your full two-weeks here and not see everything. 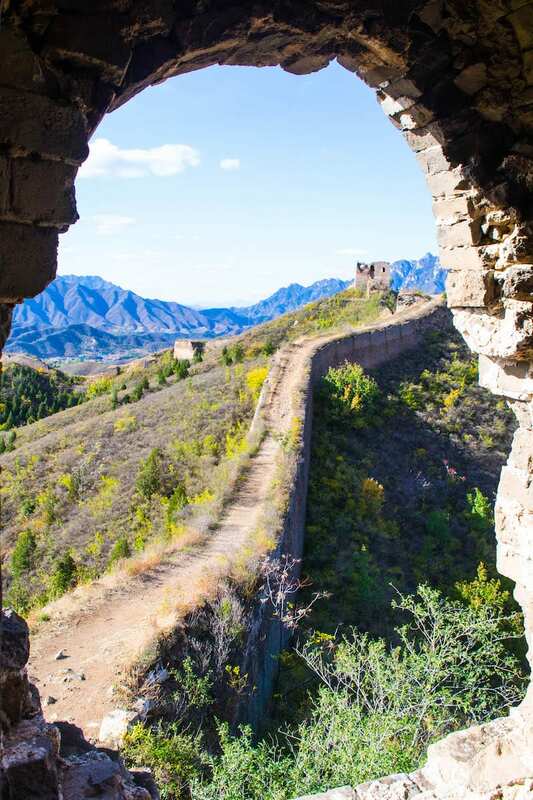 If you want to see the Great Wall the right way, my biggest advice is to get off the beaten path and visit the Wild Wall, a section of the wall not officially open to tourists. Either that, or visit a part of the great wall that is tourist-friendly, but un-restored. Check out a section like Huanghuacheng, Gubeikou, or Jinshanling. Whatever you do, I definitely recommend skipping Badaling, the most famous and touristy section of the Great Wall. If you want a section that’s easy to visit, take a public bus to Mutianyu instead. While you won’t have the wall all to yourself, you’ll avoid the crowds and have incredible views! I’m in love with Beijing’s hutongs, a network of traditional alleyway streets and courtyard houses that used to cover all of Beijing. I’ve shown so many people around the hutongs that I’ve developed my own little hutong-day tour route that covers the Lama Temple, Wudaoying Hutong, the Bell and Drum Towers, and Houhai Lake. 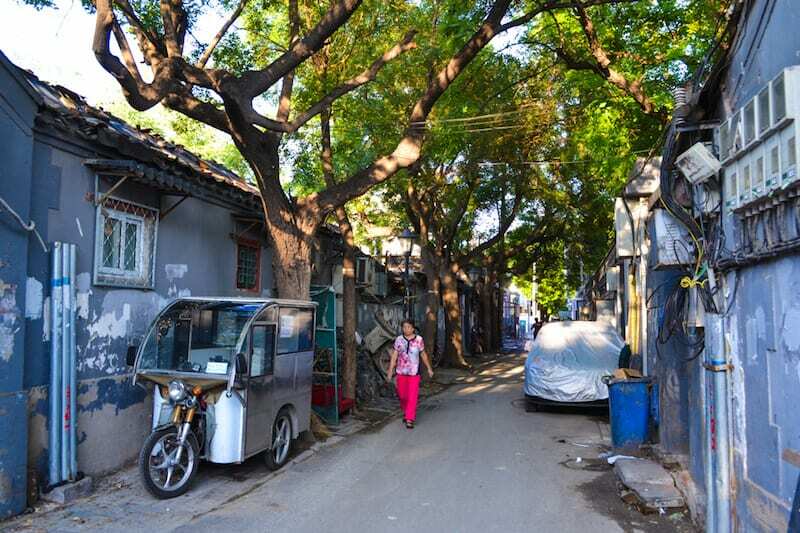 But in my opinion, the best way to visit the hutongs is to simply get lost on your way from A to B.
I also recommend taking a tour of the hutongs to learn more about Beijing’s culture and history. 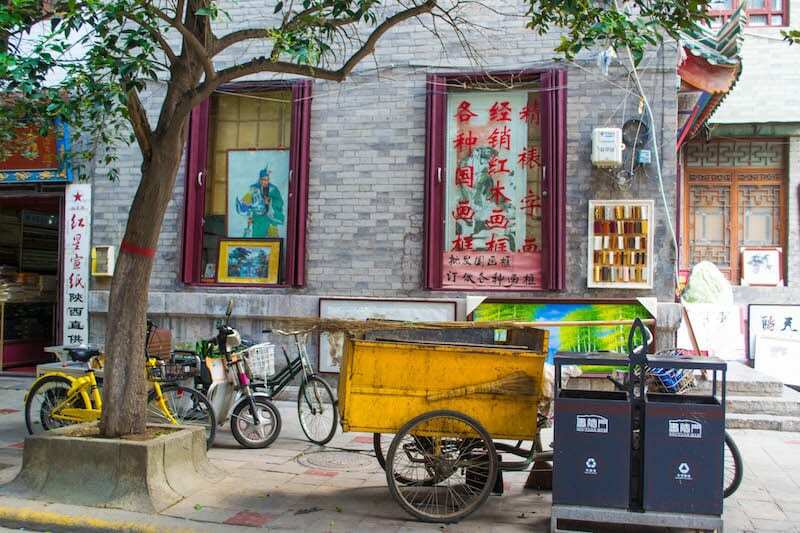 Viator, a Trip Advisor company, has a hutong and food tour. You can’t go to Beijing without seeing the iconic Tiananmen Square with the giant Mao Portrait over the top of the entrance to the Forbidden City. Spend about 30-minutes wandering around Tiananmen Square, then head into the Forbidden City, where you can explore for about 2 hours. The Forbidden City is GIANT, and you could easily spend all day there, but for me and most of my family and friends, two hours is just enough to see all of the main sights without getting overwhelmed. 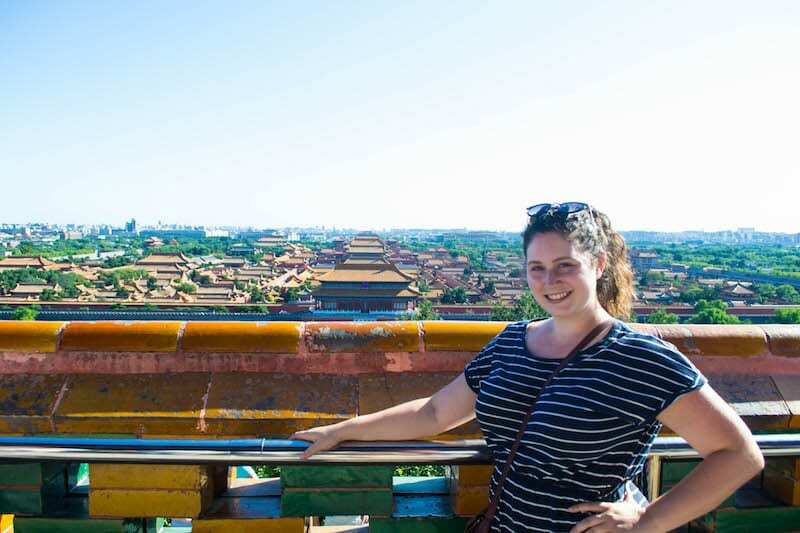 Once you’re finished with the Forbidden City, head to Jingshan Park, where you can catch a view of the Forbidden City (and the rest of Beijing) from above! Xi’an is one of my favorite cities in all of China. This ancient capital is a must-see on your China itinerary and is very easy to get to from Beijing. While it’s tempting to take a quick flight, I actually recommend riding the 4.5 hour high-speed train instead. Once you factor in arriving at the airport 2 hours early, and how far the airports are from both cities (and the fact that Chinese flights are always delayed), the train ends up being both faster and cheaper than flying! 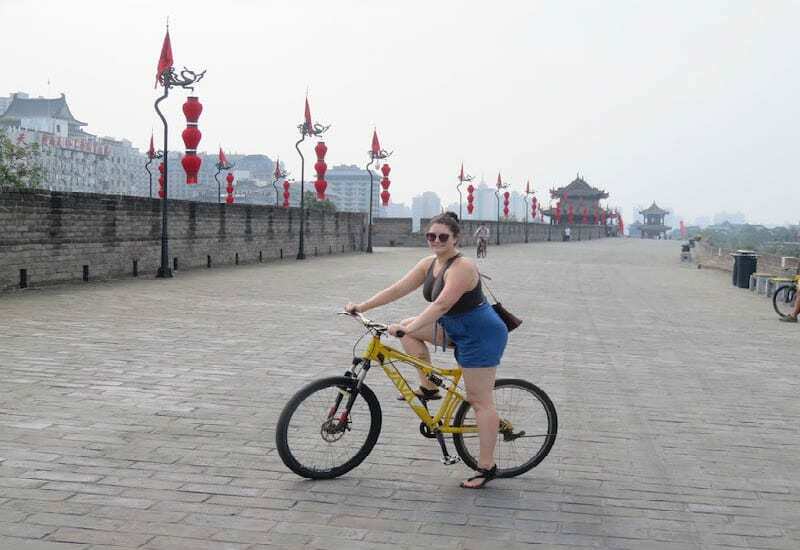 Biking around the ancient city wall is a must on your trip to Xi’an. You can rent bikes at many of the main gates on the wall, but personally, I recommend starting at the South Gate. A bike trip around the wall can take anywhere from 1-2 hours depending on how often you stop for photos. Not only will you get to explore this ancient site by bike, you’ll have a view of all of downtown Xi’an from the wall! Once you get off the wall I definitely recommend exploring the art and caligraphy district near the South Gate. There are so many shops and souvenirs in the area, and it’s a beautiful neighborhood to photograph. The best time to head to the Muslim Market is just before dinner. Eat your heart out at the many food stalls, and wander through the souvenir area to bargain for things to take home. While you’re here, be sure to try local lamb kebabs and liangpi noodles! You can’t go all the way to Xi’an without taking a day-trip to the Terracotta Warriors – plan time for it on your China itinerary. This ancient army dates back to the first emperor of China, Qin Shihuang, and is China’s equivalent to the pyramids. Here you can see row upon row of life-size terracotta warriors in giant pits. Altogether, with the bus ride and visiting the site, you’ll want to budget your morning and afternoon for this day-trip. If you can manage to squeeze in a day-trip to Hua Shan, then I 100% recommend it! Take a harrowing cable car up the side of the mountain, to embark on the “world’s most dangerous” hike. 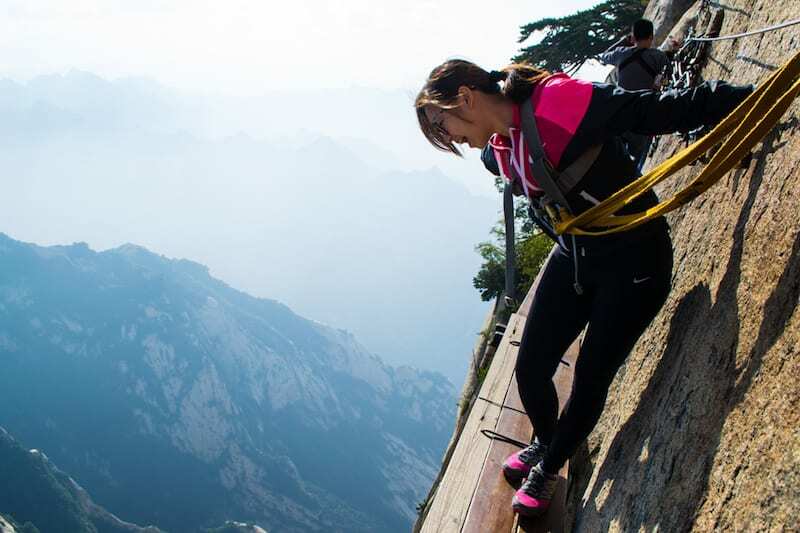 Here you can find the infamous Hua Shan plank walk, where you’ll strap yourself into a harness and walk along a plank embedded into the side of a cliff. The view down is enough to make your heart beat out of your chest, it’s one of the craziest things to do in China, but the experience is worth it! 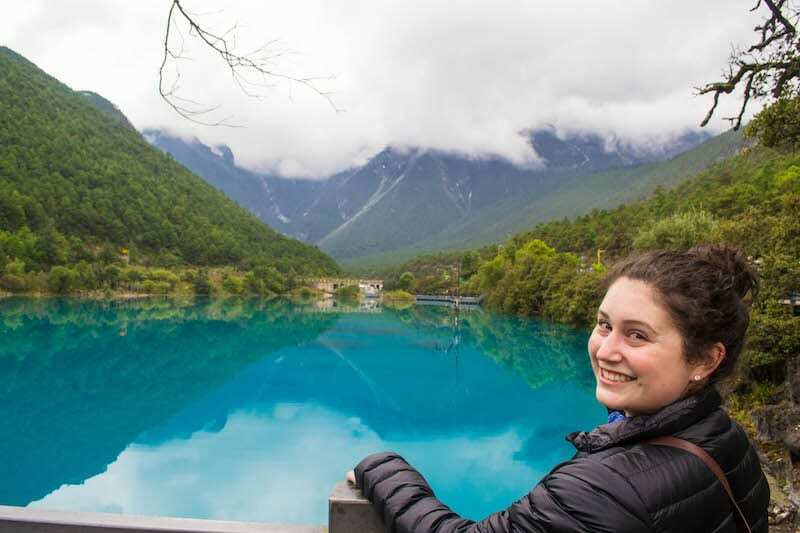 Jiuzhaigou in northern Sichuan is one of the most beautiful places I’ve ever been, and one of the best places to visit in China. Hike all day through crystal-clear lakes and rivers that reflect the bright blue sky. Here you’ll be able to see all the way down to the bottom of each lake, and capture photographs most people could only dream of. The next morning head to Huanglong, which is known for its colorful calcite deposit pools. These sky-blue mushroom-cloud pools make it obvious why many Chinese people call Huanglong a “fairyland”. 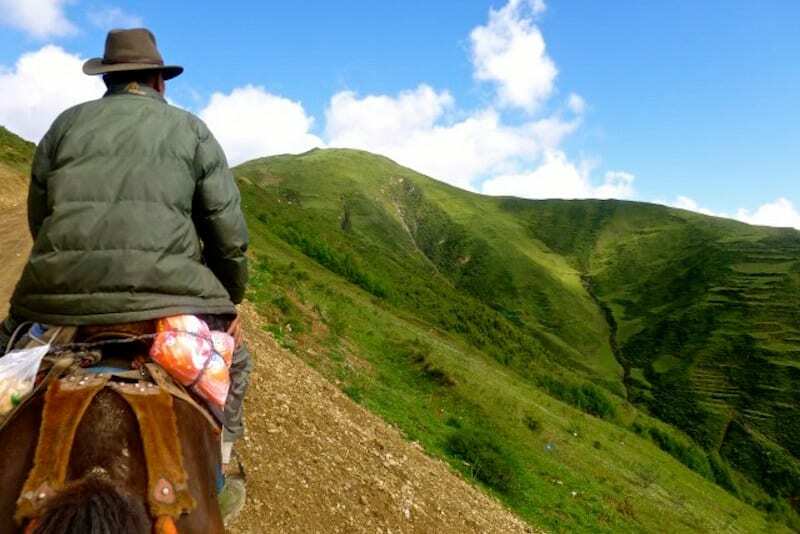 If you love riding horses, you’ll definitely want to put this on your China itinerary and take a one-day horse trek on the Tibetan plateau. The cute mountain town of Songpan, just near Jiuzhaigou, is home to day and overnight trips on horseback. Travel with a local Tibetan guide, and explore parts of China that most tourists will never see. After a quick flight or a 4-6 hour bus ride down to Chengdu, you’re going to want to spend the afternoon exploring the beautiful gardens and teahouses in this scenic city. 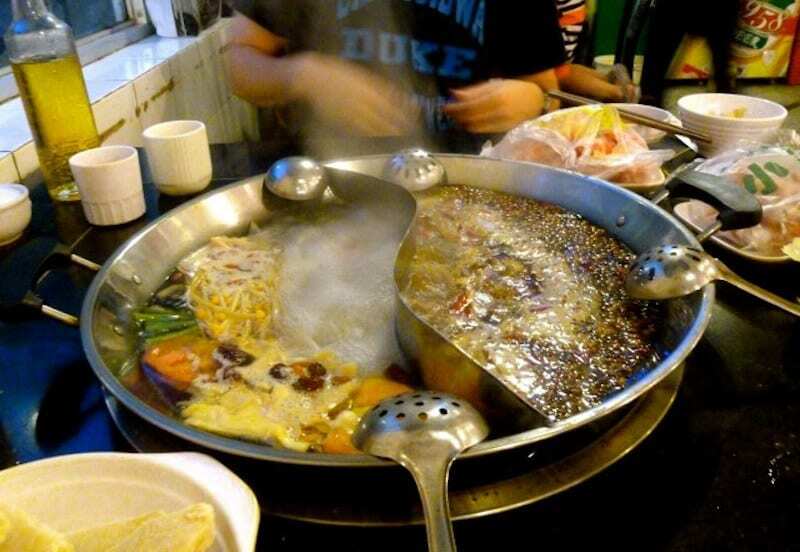 For your first evening, I also highly recommend going for hot pot, a famous eating experience from Sichuan and Chongqing. Don’t worry, they have non-spicy broth for those who can’t handle the heat! When in Chengdu, you’ll need to take a trip to the Leshan Buddha, the largest carved stone Buddha in the world. You can easily hop on a day trip from your hotel, or take one of the many tourist buses there and back. This Buddha is definitely worth the two-hour trip to see its massive scale. I’m about the size of one of his smaller toes! If you visit Chengdu, you definitely can’t miss the Panda Reserve, it’s one of the best things to see in China. Be sure to head there in the morning, when the pandas are most active. Catch them eating bamboo, playing with one another, and sleeping in trees. Who knew little pandas love to sleep in trees? You’ll also need to head to the baby area, where they have the youngest pandas playing with toys and rolling around. Trust me, the Panda Reserve will definitely be a highlight of your trip. 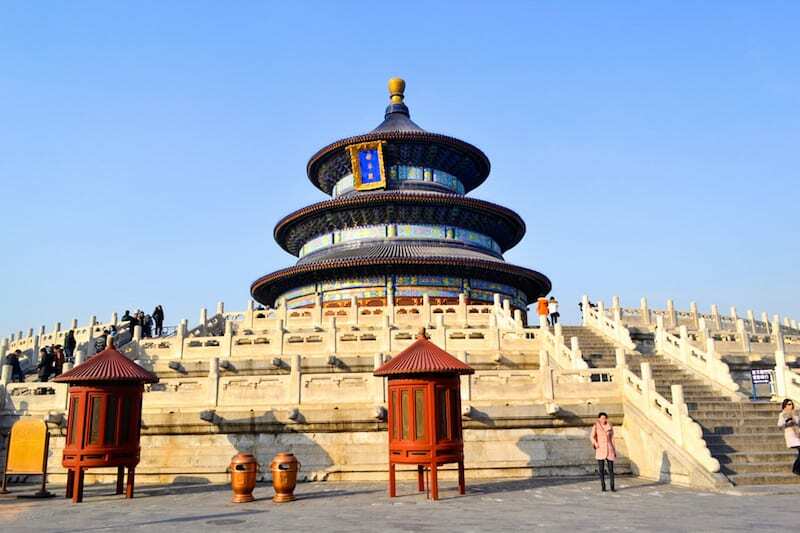 For your last day in Beijing, I recommend visiting the Temple of Heaven, my favorite imperial site in the country and one of the top China tourist attractions. Afterwards, you can head over to the Pearl Market, one of my favorite bargaining markets in Beijing. Stock up on sunglasses, electronics, silk, pearls, and a new suitcase to get all of your shopping home! I know what you’re probably thinking. Wait… no Shanghai on this list of places to go in China?! Personally, I’m not a huge fan of Shanghai as a tourist city. My decision to skip it might be pretty controversial, but I honestly think there’s much more to do and see for a traveler in Beijing, than in Shanghai. Besides, it’s always much cheaper to get a round-trip flight in and out of the same city. However, if you really want to visit Shanghai before you leave, I have an optional Shanghai ending in this itinerary as well. Just keep in mind, you’ll only want to head to Shanghai if you can actually sightsee on day 14, instead of using day 14 to fly home. If you really want to spend some time in Shanghai, make sure you have two full days at the end of your trip to China to give this mega city justice. Of course, you’ll need to see the Bund. 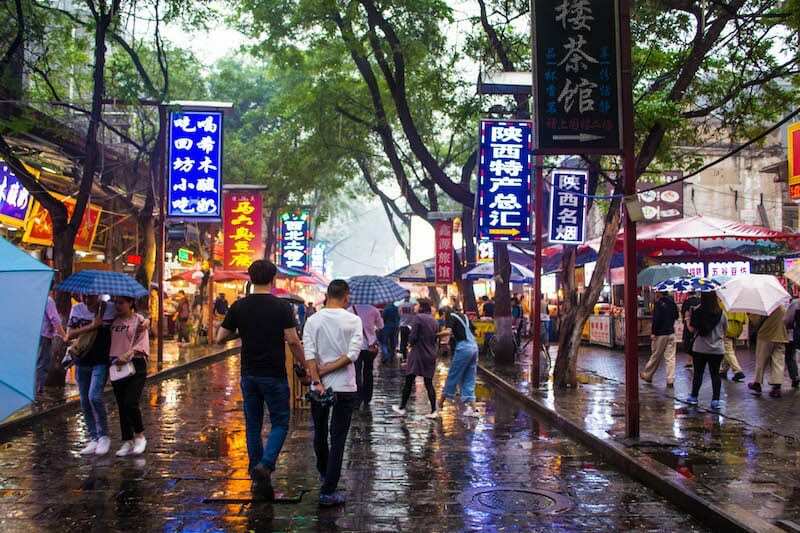 You may want to stop by a few other famous sites like the Yu Yuan Gardens and surrounding area, Jing’an Temple, and the French Concession. I also highly recommend slurping on a plate of soup dumplings while in Shanghai. Many people say that the best soup dumpling place is just outside the Yu Yuan Gardens (you’ll find the line without even trying), but personally, I recommend going to a small local place outside of a touristy area to get an authentic experience. 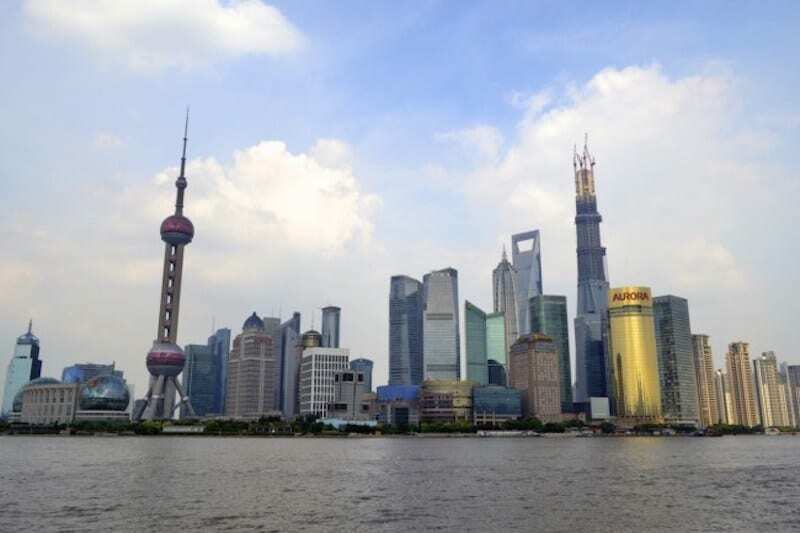 Finally, if you want a great view of the city you can go up in one of Shanghai’s iconic buildings. I’ve only been up in the JinMao Tower, but I’m dying to visit the Shanghai World Financial Center because they have a glass-bottom floor! From either of these skyscrapers, you can see all of the surrounding city, and the world-famous Pearl Tower right next door. Obviously, with a country as large as China, there are so many options for where you should spend your two weeks. Substitute Sichuan with a week in Yunnan, or end your trip in Guilin and Yangshuo. There are far too many incredible places to visit in China, and the unfortunate reality is that it’s impossible to see everything in a few months, let alone two weeks! However, this China itinerary will create an incredible trip around China and is designed to give you a great introductory visit. 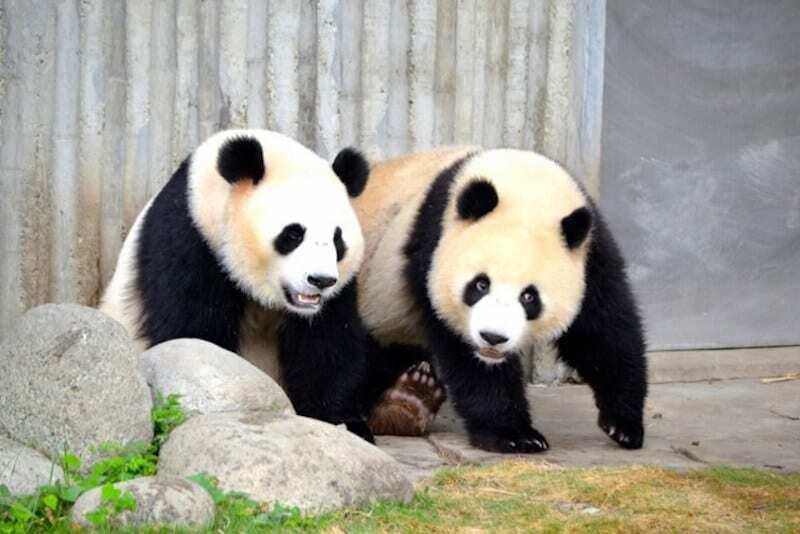 You’ll get a peek at China’s politics, history, culture, pandas, cuisines, and natural beauty. You’ll explore the biggest cities, and smallest countryside towns, all while following a schedule that gives you time to appreciate each place. Traveling to China can be daunting, and while there is no such thing as a perfect two week China Itinerary, in my opinion, this one is as close as it gets! Booking.com has thousands of properties in China including hotels, apartments and hostels. You get free cancellation on most rooms and a best price guarantee. Intrepid Travel offers a 13 Day Explore China Tour plus a 22 Day Highlights of China & Tibet Tour. See all Intrepid Travel tours here. G Adventures offers a 21 Day Essential China Tour, a 15 Day China & Tibet Tour, and a 12 Day Best of China Tour. Viator offers small group tours of China to the most popular places and attractions, including Great Wall of China tours. I hope this list of places to see in China helps you plan your own China trip. If you have any China travel tips, please share in the comments. Next articleDelsey Suitcase Review: Best Travel Luggage for Style, Durability, and Price! Shan, This is prob one of my fave posts! Like, so much so that it makes me want to time me and B’s trip out there just right to catch next year’s SongKran! This is perfect! but any suggestions on where to stay? Boyfriend is coming to visit and we’d love to spend a weekend in Edinburgh but I’ve no idea about accommodation. Any thoughts? ?